​ It’s quite unusual for a cooperative artists gallery to be partnered with a land trust, so let us give you a brief backstory. Ned Simmons, a well-known Trinidad resident, had a small gallery exhibiting local artists in the front room of his home. When he passed away he bequeathed the home to the Trinidad Coastal Land Trust in the hopes it would remain a gallery. The land trust is ‘dedicated to protecting for the public benefit the natural beauty and character of Humboldt County from Little River to Big Lagoon’, and as a non-profit holds title to nine properties and 11 easements. 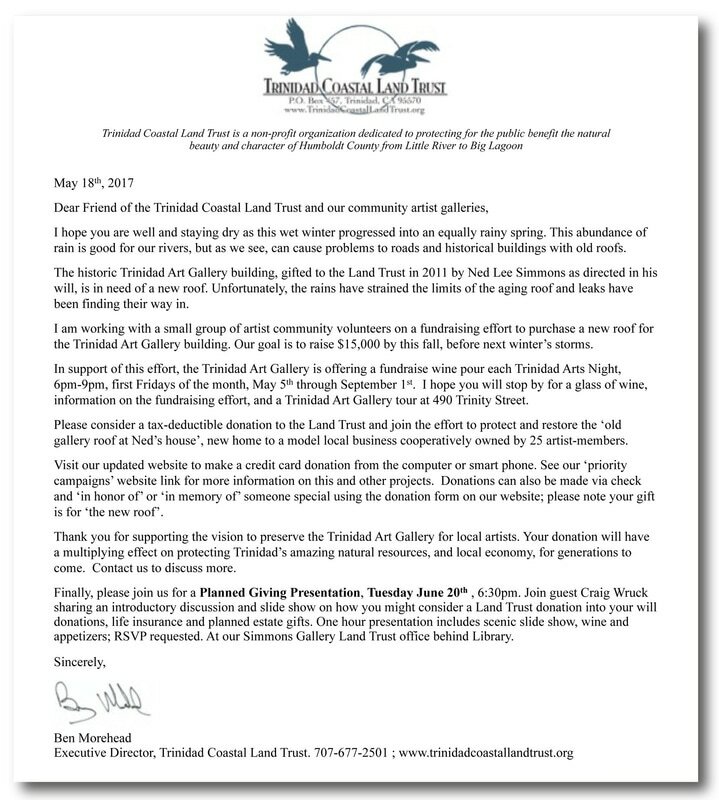 As busy as that keeps the Trinidad Coastal Land Trust, they were not in the position to operate a gallery! That’s where our partnership came in. TCLT accepted a proposal from our group of local artists to rent this historic building, and as an artists cooperative, operate a gallery to exhibit our art here in town. The rest, as you know, has been up to your visits and support as this cooperative gallery successfully enters it’s 5th year. As artists who greatly appreciate the Trinidad Coastal Land Trust’s stewardship of this beautiful coastline, the wine table at our TRINIDAD ART NIGHT openings will have information on the land trust, the property it maintains and protects, and the chance to lift a glass of wine to salute to our unique art/land trust partnership. Do stop by and join us in this fundraising celebration! For additional information about TCLT and their efforts to maintain and preserve this historic building that houses our artist’s cooperative, we share (below) the letter they recently submitted to our local community.